Apart from cost-efficient remote-power plants, XANT wind turbines also become assets on a balance sheet. Larger projects consisting of multiple turbines, or projects in rural areas of the south are often debt-financed. Understandably banks ranging from international development aid agencies to the branch office of your local bank like to see an independent review by a qualified bureau or certification body. XANT has a tradition of letting knowledgeable third parties scrutinizing our designs. During discussions with their seasoned engineers our design team was obliged to justify technological choices and underpin the concepts of aerodynamics, drive train, yaw system, control and safety system. Throughout collaborations with leading structural design bureaus our in-house finite-element analysis (FEA) results are corroborated with their expertise. Our bearing selection has been discussed with leading suppliers of big brands with short names and the manufacturer’s detailed life-time calculation modeling has been used to predict longevity. At the very start of XANT we worked intensively with Germanischer Lloyd (now DNV-GL) in a Development Accompanying Assessment. 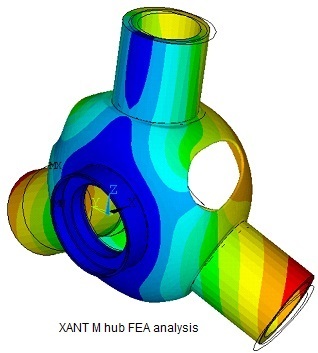 This collaboration resulted in a Type-D design assessment as a first seal-of-approval of the XANT M design. Throughout upgrades and improvements, every next XANT M version is essentially a little better than the previous one. Over the past years the design has matured and it was thus useful to repeat this exercise. During the last 12 months, the experts at TÜV-SÜD have investigated every detail of the XANT M: from the design basis assumptions, over the design load cases to the manufacturers’ certificates and the Safety System programming. We are happy to announce that the XANT M design has successfully past this test. Bringing you peace of mind and guaranteed profitability when investing in mid-size wind is XANT’s mission. We are happy to continue providing you proof of this. The XANT product portfolio consist of the XANT M (100kW) and the XANT L (330kW) – commercially available in 2019- platforms. Both turbine types exist in class Ia (average wind speeds up to 10m/s) and class IIIa (7.5m/s) executions; for extremely cold areas the XANT M ETR (Extended Temperature Range) version is available.